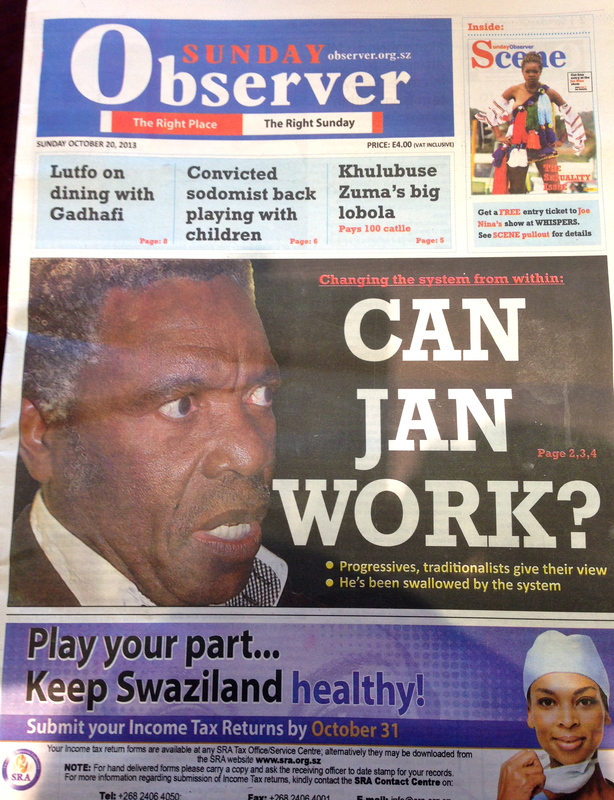 The Swazi Observer Group of Newspapers has a new publication, the Sunday Observer. Pages 2 and 3 were dedicated to differing opinions on whether Sithole will be able to usher in a more democratic system. Some in civil society said they will work with him as he pushed for reform inside parliament; others said he stood no chance of effecting any meaningful change — they said “the system” had already “swallowed” him up. By “the system” they mean the current Tinkhundla system of governance — ruled by King Mswati III “in consultation” with the people. Other leading stories focused on former Swaziland minister of labour Lutfo Dlamini’s one-time dinner with former Libyan leader Muammar Gaghafi, and how Dlamini plans to go into business after not being elected or appointed back to parliament. The Sunday Observer has sections on news, sport, opinion, world affairs, and fashion. 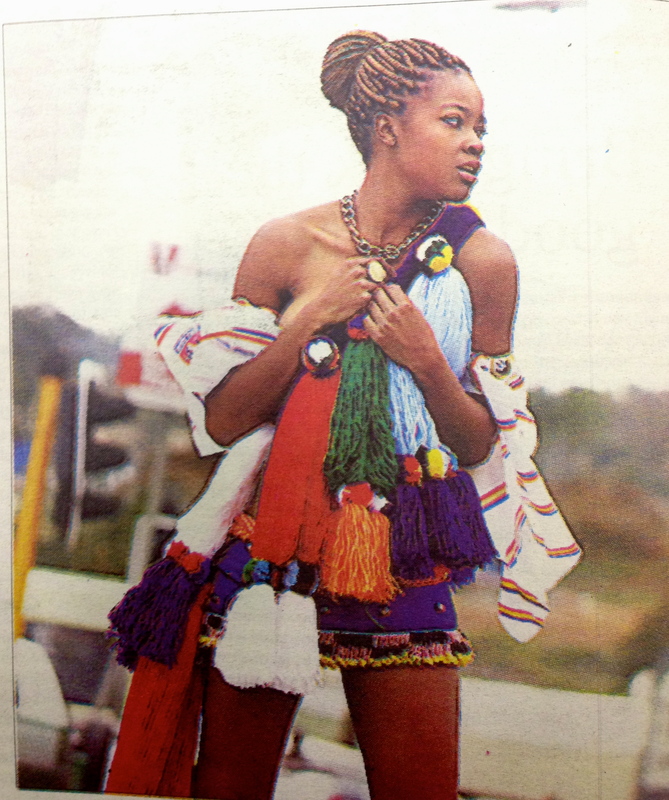 In an effort to challenge negative stereotypes of women, the fashion lift-out — called “Scene” — featured a daring photo-shoot of a model in traditional Swazi dress at the notoriously dangerous and misogynous Manzini bus rank. The debut edition of “Scene” was titled “The Sexuality Issue”. Editor of the fashion lift-out Koko Shanbangu says it “addresses the matters that have been shoved under the carpet”. Shabangu continues: “A lot of women, myself included, have fallen victim to insults from men on the streets because we were wearing something ‘too short for them’. When does it stop? I was very glad that our cover girl, Sasha Groening, was fearless enough to wear indlamu (traditional dress) in the middle of the road on a cold Sunday morning! The cleverly subversive and thought-provoking photo-shoot is sure to raise a few eyebrows. The photos manage to poke holes in the prevailing culture — considered by many to be male-dominated — by using a big part of that culture: the female traditional dress, which is short and allows for much skin to be seen. 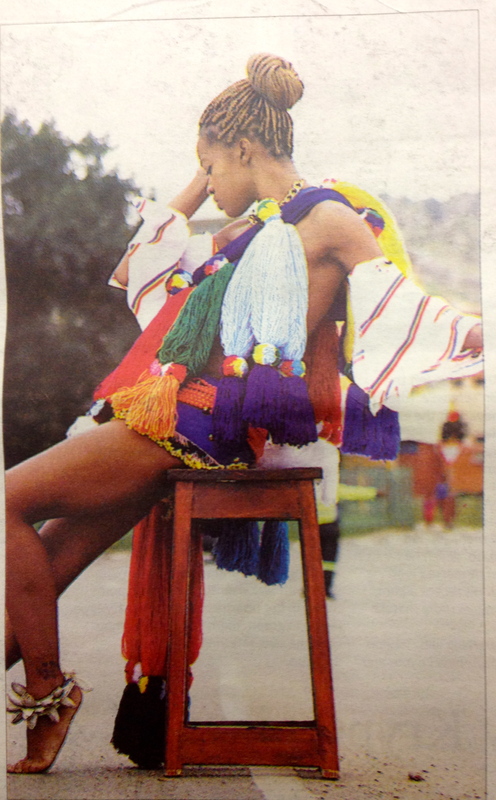 In her editorial Shabangu praised the photo-shoot team, giving special thanks to photographer Peppy Sibanyoni. The next edition of Sunday Observer will be out next week on October 27. 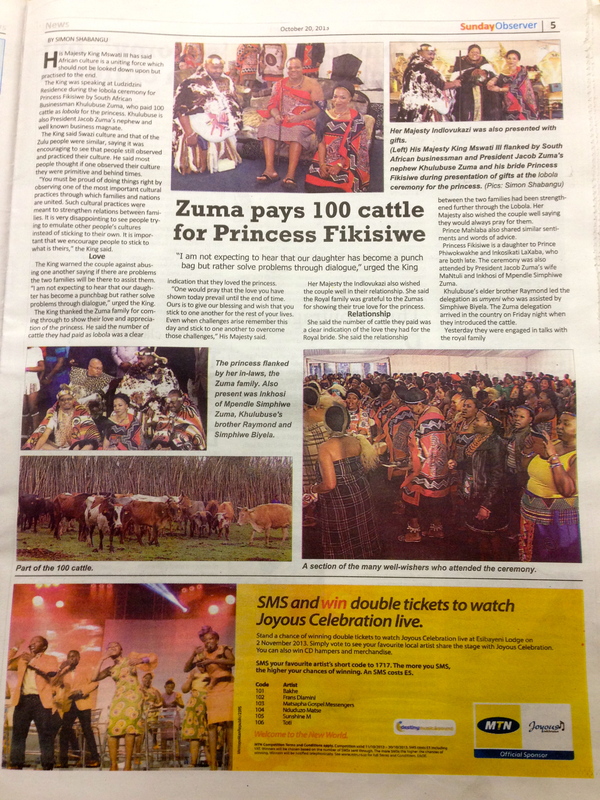 The Swazi Observer Group of Newspapers is owned by investment fund Tibiyo Taka Ngwane. This fund is controlled by King Mswati III “in trust for the Swazi nation”. Tags: Jan Sithole, king mswati iii, Peppy Sibanyoni, Sasha Groening, Sunday Observer, Swazi Observer Group of Newspapers, swaziland. Bookmark the permalink.